In its broadest definition, social networking means to participate in an online community in which people interact with one another in various ways. Examples include social networking sites like Facebook, blogs, micro-blogging services such as Twitter, discussion boards, and chat rooms. A social networking site may offer a variety of communication methods, including private messaging (like email except only on that site), making comments on a friend’s page, sharing URLs to other sites, uploading photos, and journaling. Although most social networking sites are personal and social in nature, such as Facebook and Myspace, social networking sites can also include business and career oriented sites like LinkedIn. Facebook is the most popular social networking site today, with millions of registered users. To sign up for an account, click the Sign Up link. What can you do when you’re there? Well, the first thing you may want to do is find your friends and relatives and “friend” them. That means sending them a friend request, which they then accept (hopefully), and from that point on, your accounts are linked in a friend relationship, and you can see each other’s posted activities and information. To find a friend, click the Find Friends hyperlink on the shaded bar at the top of the page. If the person has a common name, you may have to sift through multiple listings to find the right person. 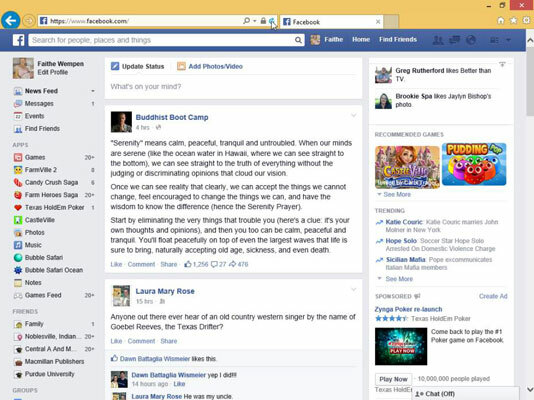 The figure shows a Facebook feed. The feed is the ever-changing stream of activity reports that show what your friends are up to. To post a status update, type it in the What’s on your mind? box near the top of the page. A discussion board is a place where you can post written messages, pictures, and videos on a topic. Others can reply to you, and you can reply to their postings. In a variation on discussion boards, you’ll find blogs (web logs) everywhere you turn, and you can also post your comments about blog entries. Discussion boards and blogs are asynchronous, which means that you post a message (just as you might on a bulletin board at the grocery store) and wait for a response. Somebody might read it that hour — or ten days or several weeks after you make the posting. In other words, the response isn’t instantaneous, and the message isn’t usually directed to a specific individual. You can find a discussion board or blog about darn near every topic under the sun, and these are tremendously helpful when you’re looking for answers. They’re also a great way to share your expertise — whether you chime in on how to remove an ink stain, provide historical trivia about button styles on military uniforms, or announce the latest breakthroughs in your given field. Postings are likely to stay up on the site for years for people to reference. 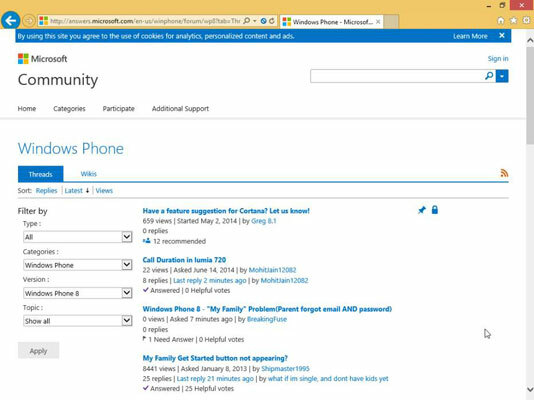 Go to the Microsoft Support discussion groups. Some discussion boards require that you become a member, with a username, and sign in before you can read messages, although this site doesn’t. You must sign in, however, before you can post. Under the Browse the Categories heading, click a category. For example, click Windows Phone. In the topic list that appears, click a sub-topic to narrow down your interest. Continue to click until you get to a specific discussion board. When you click a posting that has replies, you’ll see that the replies are organized in the middle of the page in easy-to-follow threads, which arrange postings and replies in an outline-like structure. You can review the various participants’ comments as they add their ideas to the conversation. There are thousands of discussion boards all over the Internet that you can participate in, for every imaginable topic. Most websites for a product have a Support section, for example, that includes a user-to-user support discussion board. A blog (short for web log) is an online journal. It can be entirely private, open to invited guests only, or available to the general public. Most blogs are personal in nature, but some companies have corporate-sponsored blogs that employees write to convey information informally to the public. For example, Microsoft encourages many of their employees to blog about new product developments, and it even hosts their blogs on official Microsoft servers. In addition, some independent contractors blog about their work to become more well-known in their field and to share information with others in similar professions. There are millions of active blogs all over the Internet, so you may just content yourself with reading other people’s writings. You might start with a popular blogging site such as WordPress, TypePad, or Blogger, and browse the blogs on the home pages. Or, you might have friends or relatives who blog and you might bookmark their blog pages for regular reading. If you want to create your own blog, your best bet is to sign up for an account on a blogging website (again, WordPress, TypePad, and Blogger are the popular ones). A basic account is free; you can pay extra for upgrades, but if you’re just getting started, you might as well wait and see if you actually like blogging. After creating your account, you can enter the text for your blog entries directly into the website, or if you prefer, you can use an offline blogging application. 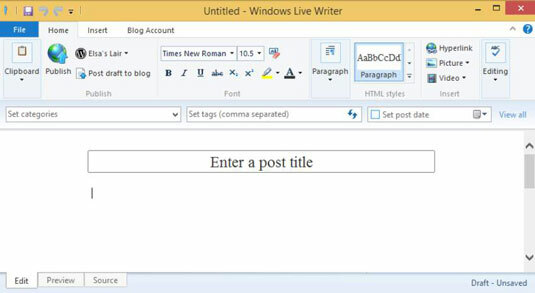 Microsoft Word works to compose blogs, but a perhaps easier tool to use is Windows Live Writer, which is part of the Windows Live suite of free apps that Microsoft offers. When you run Windows Live Writer for the first time, it prompts you to enter the URL and login information for your blog. After you enter those once, the application remembers them thereafter, and each time you start the application, a new post document starts. Write and format your post as you would in a word processing program, and then click Publish to publish it to your blog. Twitter is a micro-blogging service, where you can post status updates in short, 140-character chunks. Posting a status update is known as tweeting. You can tweet from the Twitter website or, perhaps more commonly, from a Twitter app on a smartphone. As with Facebook, Twitter provides you with a feed that tracks the activity of people that you have chosen to follow (the equivalent of friending on Facebook). To get started with Twitter, sign up for a Twitter account. 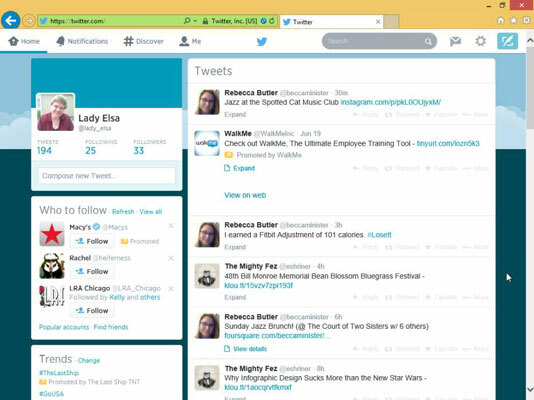 You can optionally check the app store on your smart phone or tablet for a Twitter app to use on the phone. Sending and receiving tweets is fun, but it can be exhausting to keep up with everyone else’s tweets, many of which may seem mundane and uninteresting. Do you really want to know what 20 different friends had for dinner, for example? When tweeting yourself, to make sure that your tweets are something that your friends look forward to rather than roll their eyes at, make sure you say something of substance.